I've been spinning again -- off and on, in stolen moments. 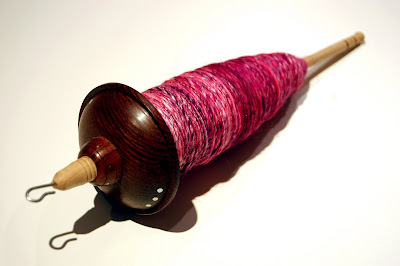 Here is my newest Avi Wasserman spindle (it's pearwood, but not sapient, unfortunately,) full of a splendid silk/merino blend: There are few colours as joyous and radiant as bright pink. When used judiciously, it's one of my favourites. Ooh, that's a new concept for me. Thanks for linking to the sapient definition. I love it! Now I can't stop thinking about how awesome it would be to have sapient knitting needles. THEY'D NEVER GET LOST! March 1, 2011 at 12:45 p.m.
March 1, 2011 at 1:01 p.m. It's gorgeous. May I ask, were you self taught or did you take spinning classes? March 1, 2011 at 1:02 p.m.
My favourite Discworld characters are The Luggage, Nanny Ogg and Horace the Cheese. As for how I learned to spin, (as with knitting) I am entirely self-taught. I did read Priscilla Gibson Robert's fantastic book High Whorling early on. March 1, 2011 at 1:06 p.m. The yarn is beautiful. I would love to learn to spin, but can't afford any more hobbies. I know its a slippery slope - before you know it, you are looking into zone laws to determine whether or not you can buy your own alpaca. March 1, 2011 at 1:49 p.m.
Oh, that pink does something to me! It's beautiful. March 1, 2011 at 2:38 p.m.
Oooh, very pretty. What will it become? March 1, 2011 at 5:06 p.m.
Spindle and fiber are gorgeous. I think it's time for me to pick up mine. March 1, 2011 at 6:04 p.m. I JUST wrote a post about Terry Pratchett. :) I've been working my way through the reading order, and just finished Reaper Man. Can you imagine if you had a spindle made of Counting Pines? March 1, 2011 at 6:33 p.m. I am feeling guilty for not spinning again! March 1, 2011 at 6:40 p.m.
Love seeing a Discworld reference! March 1, 2011 at 9:18 p.m. Very nice - both the spindle and the yarn! March 2, 2011 at 7:58 p.m. I would be scared shitless to use a spindle (or needles, or anything else) made of sapient pearwood. What if it decides it doesn't like the yarn?? Yet another sign, btw, that you are awesome--great taste in books as well as fabulous patterns. March 2, 2011 at 8:33 p.m.
March 3, 2011 at 10:05 a.m.
Oh, how I wish I could spin! March 10, 2011 at 12:35 p.m.